The health problems linked with smoking have all been well documented and there are also well documented dental problems caused by smoking. Bad breath caused by smoking may be the smallest problem you encounter but oral cancer could also be on the list. Most people are aware of the damaging effects to the body through smoking. For most, issues such as cancer are enough to make them consider quitting. However, many people are not aware of the many ways that smoking can cause damage to teeth and gums. The risks can be extremely serious and are not just confined to bad breath and stained teeth, an assumption that many people make. Plaque is of course a major cause of dental decay, and smoking aids the accumulation of plaque on teeth leading to tooth decay. The chemicals found in cigarettes such as nicotine and tar will also stick to teeth, gums, and other places in the mouth. This is one of the reasons that smokers can suffer from bad breath. Smoking also causes dry mouth, stopping the flow of saliva and allowing bacteria to flourish. Without the flow of saliva bacteria can quickly accumulate and cause problems to teeth. 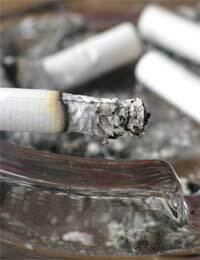 Smoking can also cause a great deal of problems to the gums. Tobacco use limits the amount of blood flowing effectively through the body and to the gum area. This can cause severe problems to gum tissue and the bones in the mouth. Gums can become severely inflamed and loosen, allowing bacteria into the loose areas. Once plaque has successfully taken hold in these recesses it is extremely difficult to clean and this is when the teeth can become loose. If this problem is not tackled by a dentist the worst case scenarios can be tooth loss and bone damage. Smoking can be the bane of the dentist’s life when it comes to successful dental treatments. It has been known for dentists to actually refuse certain types of dental treatments to smokers. In every case, smoking will be actively discouraged after dental treatments. Smokers can develop dry sockets that will prevent healing. Patients who undergo dental implants have a lower chance of a successful treatment than those who do not smoke. Healing of the gums is a fundamental part of the implant procedure and smoking will decrease the healing time of the gums. Oral cancer is one of the most serious problems that can occur due to smoking. Reports from the Oral Cancer Foundation state that one person dies from oral cancer every hour. Tobacco is the number one cause of oral cancer but it is curable if the cancer is caught in the early stages. In its early stage oral cancer can appear as an ulcer and this is why it sometimes goes unnoticed. This cancer can spread through the lips, mouth, and throat and any new lesions to the mouth or lips should be looked at by a dentist. The best way to avoid the dental problems associated with smoking is to quit smoking. Once a person quits smoking the damage done to the gums won’t be any less but the health of the gums will increase greatly. This increase in gum health can take place as rapidly as a year after quitting. Dentists will also have much more success of treating the damage and can help prevent any damage to the teeth and gums that will occur in the future. Smoking and dental damage is a far more serious issue than most people think. Dentists are continually trying to make their patients aware of the damage that can occur due to smoking. The teeth and gums are an important part of the body and deserve just as much respect and care as any other body part.